Myth: Tootsie Roll Industries used to give away prizes if the wrapper of a tootsie roll pop had a Native American boy shooting a star. Due to the fact that that the Native American boy shooting the star appears on about 1/3 of the wrappers, it would significantly cut into their profits if they decided to do this. Although Tootsie Roll Industries doesn’t endorse this, some individual stores have occasionally honored the infamous rumor and awarded children with a free Tootsie Pop if they brought in a star-imprinted wrapper. This is thought to have been largely why the rumor has continued to be perpetuated, even to this day. It also may be how the rumor got started in the first place with some single store starting this promotion on their own, with people thinking it was Tootsie Roll Industries doing it, meaning you could trade in the wrappers at any store. Many have researched exactly how many licks it takes to get to the center of a Tootsie Pop, including reserchers at Cambridge and Purdue. The results obviously vary significantly based on age of the individual and whether one licks just one side continually or both. That being said, their results show that for an adult it takes around 250-ish licks to get to the center of a tootsie roll tootsie pop if only licking from one side and about twice that when licking both sides evenly. 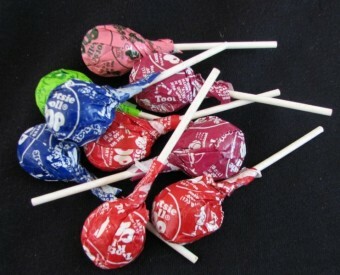 Tootsie Pop suckers were introduced into the world in 1931. Tootsie Pops were the first lollipops to embed a candy “prize” in its center. The original five flavors of Tootsie Pops include Chocolate, Cherry, Orange, Grape, and Raspberry. Over the years, Tootsie Pop flavors expanded to include a sixth flavor that alternates between Pomegranate, Banana, and Green Apple. Tootsie Rolls were named after creator Leo Hirshfield’s five year old daughter whose nickname was “Tootsie” (her real name was Clara Hirshfield). Hirshfield set out to create a chocolate that wouldn’t melt easily and eventually came up with the artificial “chocolate” candy the tootsie roll. This ability to not melt easily and to use artificial ingredients that weren’t being rationed during war times proved a huge boon for the company as it eventually began being included in all soldier’s rations during WWII. The low price of the artificial ingredients also made it a popular treat during the depression along with the tootsie pop. The tootsie pop was created in 1930 by Brandon Perry who was working for The Sweets Company of America who also made tootsie rolls. About 64 million tootsie rolls are produced every day along with twenty million tootsie pops. Whenever someone mails in a letter to Tootsie Roll Industries stating how many licks it took to get to the center of a tootsie pop, they are sent a certificate called a “Clean Stick Award”. In response to the overwhelming inquiries of free Tootsie Rolls for wrappers featuring the Indian boy and his star, a story was developed as a sort of consolation prize. The Legend of the Indian Wrapper tells the story of one man’s mission to make a one-of-a-kind lollipop that the world had never seen. His plan was to insert a chewy candy into the center of his lollipop, but no matter how hard he tried, he always failed. One night a grand Indian chief appeared and offered to help him as long as he promised to never stop making the lollipops with the chewy center for people. Of course, the man agreed. As the legend has it, every so often the grand Indian chief visits the man’s factory to check and make sure he keeps his promise. The Indian boy wrapper with the star is a sign that the grand chief personally checked that particular lollipop for its chewy center and gave it his sign of approval. When I was a kid there was a candy store (Sarah-Dippity Chocolates in Encinitas, California) that honored this rumor, whether tootsie pop did or not. You had to have the whole image though, if it was cut off at all it was worthless. Me and my siblings believed it because we always did get a free one at the corner candy store. Now I read that the promotion isn’t from Tootsie so I guess we had a very nice store owner who gave out of the kindness of his heart. The bank where my folks did business when I was a kid had a Tootsie Pop Tree in it and kids got a free one if you came in with your folks when they did business. One day I got a wrapper with an indian chief on it and was quick to point this out to a teller and wanted my free tootsie pop. She said she had never heard of any such thing and gave me this “get lost” look. My dad and the bank president were fishing buddies, so I went over to his desk and pointed out my wrapper had an indian chief on it. He told me by all means to go over to the Tootsie Pop Tree and collect my free tootsie pop. Being the little snot I was as a kid, I walked over to the tree, took the “prize” off the tree with a flourish and shot the teller a snarky smirk as I walked out the door. When I was a kid I remember stores in my location that honored this so this is not correct. @Dan: True, there were stores that sometimes honored this, but those stores were not Tootsie Roll Industries. Helps if you read the whole article. when I was a kid I always wondered if we got a free Tootsie Roll for the Indian on the wrapping paper.I couldn’t wait to find out when I got my first one when I brought it into the store I got shot down. Rude. We bought eight large bags of tootsie roll pops for Halloween and we’re not able to give them out that evening. Ingrid, refrigeration, plastic bags, etc. what is your suggestion?. Thanks for any help you can supply.